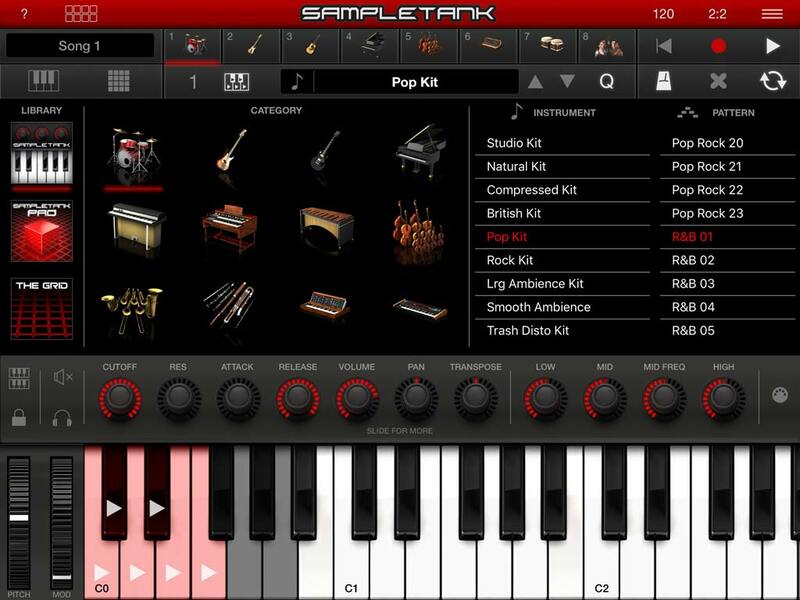 With SampleTank for iOS, you now have the power of desktop virtual instruments — without compromise — with a massive number of over 2,300 high-quality instruments and the most advanced sound and groove workstation for the mobile platform. SampleTank is the revolutionary mobile 8-part multitimbral sound and groove workstation that puts over 2,300 high quality sampled instruments and patterns and grooves at your fingertips. Based on IK’s industry standard SampleTank 3 software for Mac and PC, its sounds provide an unmatched level of realism and sonic variety that can be easily accessed, layered and used for playing live or recording in the studio. And thanks to its built-in 8-track MIDI recorder, you can record high-quality melodies, riffs, grooves and even complete songs while on the go. 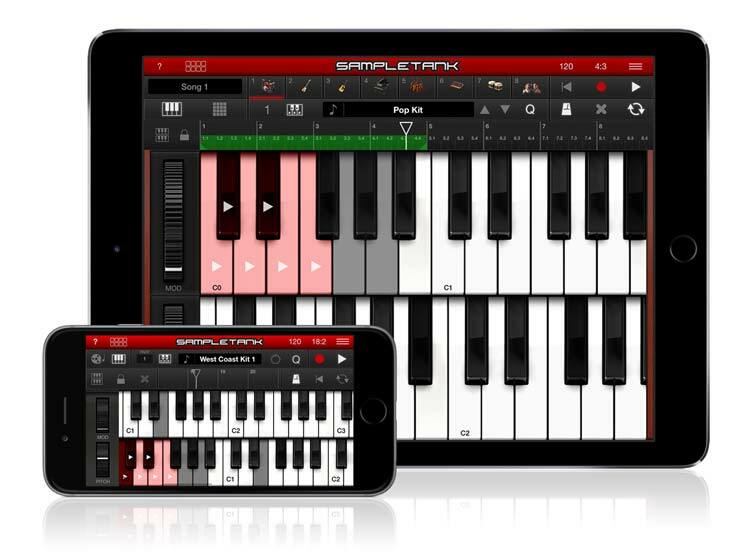 Coupled with one of IK’s iOS keyboards, MIDI interfaces or other MIDI-compatible devices, SampleTank for iOS becomes a killer ultra-portable mobile setup that lets you make professional-quality music anytime and everywhere. SampleTank is an industry standard workstation because of the sheer sonic quality and massive assortment of its available sounds. The mobile version gives you an astounding 16 instrument categories with access to over 2,300 instruments. SampleTank’s sounds have been meticulously sampled, edited, programmed and optimized in-house by IK's team of audio engineers and sound designers. It represents years of work in which IK has researched, located and handpicked timeless pianos, priceless vintage guitars, hard-to-find basses, must-have synthesizers and classic organs for a collection that’s set an unsurpassed sonic benchmark on the iOS platform. Each sound category includes MIDI patterns and grooves that you can use to start playing immediately. There are over 1,000 patterns and grooves to choose from, which means there’s plenty of room for you to mix and match for wildly creative results straight from the start. Hundreds of new sounds are now available for in-app purchase in SampleTank with six new “Pro-Instrument” packs comprising over 500 new instruments that let you customize your sound set for any kind of compositional style or musical genre. 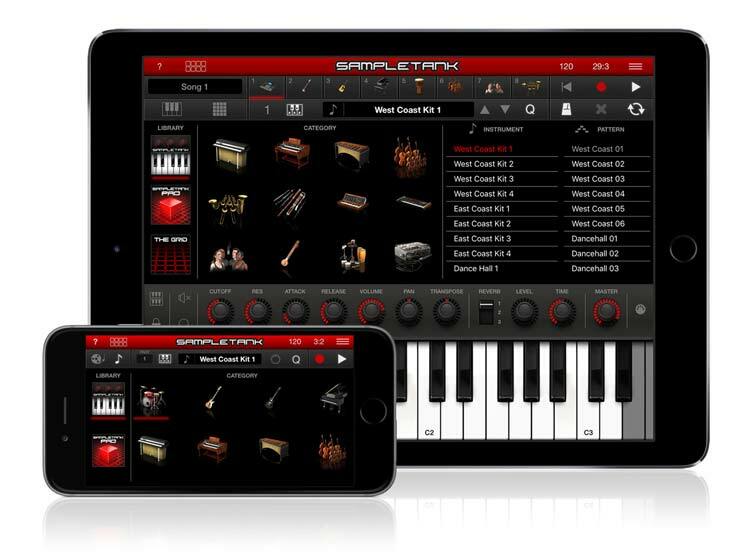 There are tons of sound options available to suit your needs: from the original SampleTank iOS collections and expansion packs that include Miroslav Philharmonik, Sonik Synth and SampleMoog, to the new SampleTank Pro packs and signature collections. Rest assured, if there’s a sound you need, you’ll be able to find it in SampleTank iOS. The new SampleTank Pro Instrument packs cover comprehensive collections of classic keys, synths, bass, ethnic instruments, voices, drums and loops. 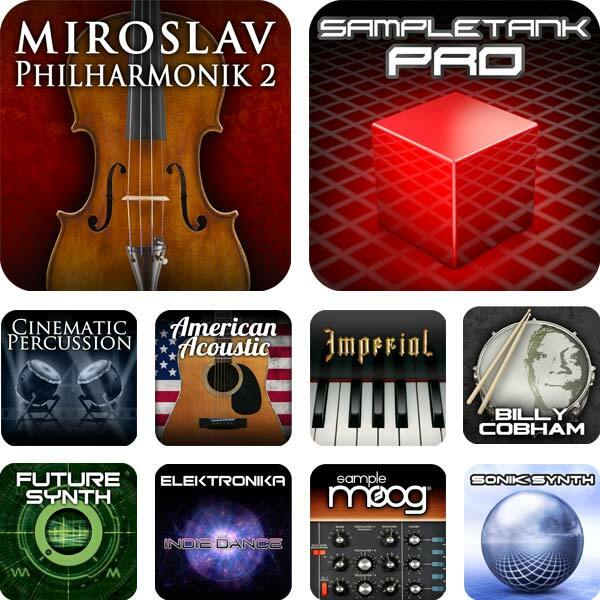 Plus, there are additional instrument collections available that are derived from the popular SampleTank 3 add-on instrument collections like Miroslav Philharmonik 2, Alan Parsons piano, Future Synths, Elektronica Deep House and more. 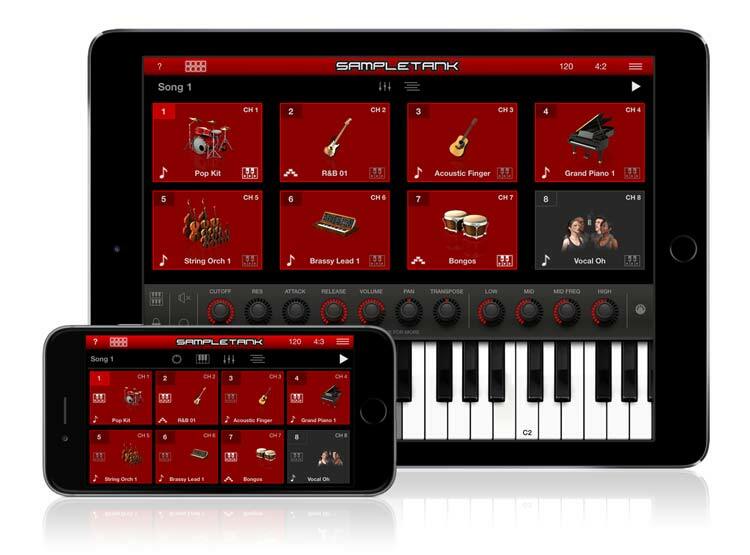 SampleTank for iOS has been redesigned to provide players and composers with environments specifically for playing live or composing. In Song mode, SampleTank gives you three views that provide a streamlined workflow for getting creative: Instrument Browser, Keyboard and Pads view. In the main instrument browser view, you can quickly and easily find and load the sounds you need into the 8 available instrument parts. The browser has been completely redesigned and streamlined with everything you need right at your fingertips. Also, you’ll find that customizing and fine-tuning your sounds is a breeze with the EDIT strip. It lets you easily alter things like panning, transposition, attack, filter and everything else you’ve come to expect from a full-featured sound workstation. Plus, you can save your favorite settings for easy recall with user presets. Once you’ve chosen and layered your instrument parts, it’s time to start composing. With the Keyboard view, you have everything you need for fast composition — transport controls, tempo control, the music timeline, and of course, a dual-row keyboard that can be customized as a "scale keyboard," displaying only the notes of a specific key or scale. From the keyboard view, you can record individual instrument parts in the 8-track MIDI recorder, sequence drum parts and compose complete songs start to finish all in one streamlined interface. You can also export your songs as audio files, or save them as “multis” setups for live performance model. 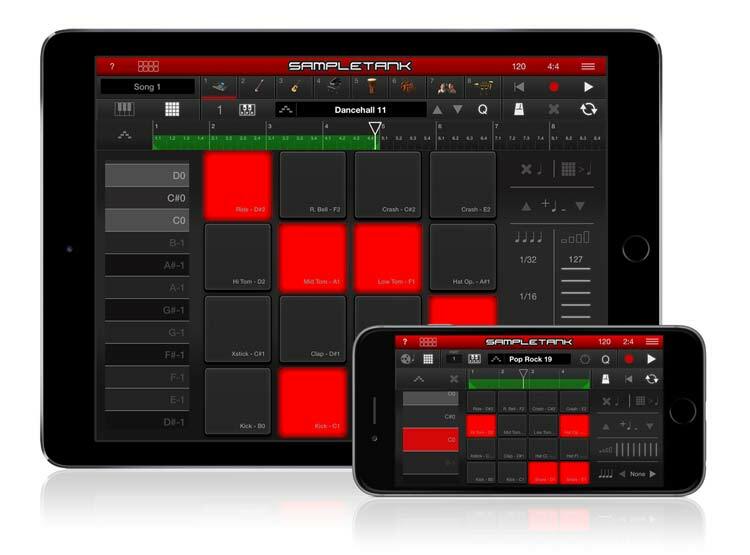 For beat makers, SampleTank for iOS features a redesigned Pad interface with 4x4 launch pads lets you create grooves and beats with ease. The new velocity and repeat sliders make complex beat programming a breeze for every skill level, plus the pattern access panel allows you to enable patterns while recording and programming beats for even more creative flexibility. Use its 8-track MIDI recorder to create sketches or even make complete songs. It lets you quickly build up a complete MIDI arrangement with its handy quantize and loop controls. You can then even export your tracks as stereo audio files to mobile apps like AmpliTube, VocaLive or GarageBand, or computer DAWs like Logic and Pro Tools. In all cases you'll enjoy lighting-fast load times, near-zero latency, tons of built-in effects (with a great sounding master reverb), the ability to layer 4 parts simultaneously and much, much more. SampleTank for iOS now features Live mode, a unique interface optimized for playing and manipulating your sounds with ease. In live mode, you can quickly and easily activate sounds, patterns and loops, and play individual instruments and multis — everything you need to perform is right at your fingertips. The main view in Live mode gives you access to the 8 instrument parts for quickly activating instruments and patterns. You can turn each one “on” and “off” and set the MIDI channel for each and activate the patterns menu. This view also features the instrument Edit strip that lets you customize each instrument on the fly. Live Mode also features two additional views: the Mix view and the Layers view. The Mix window gives you individual volume and pan controls for each instrument, much like on a traditional mixer, and all editing parameters are available in this view. The Layers view lets you assign each individual instrument to regions on your MIDI controller, thus creating layered sounds and “zones” for instruments. This lets you quickly create instrument combinations like bass on the left side, piano and strings for the right hand. And since you can create multiple layers, the live performance sound design possibilities are endless. In Live mode, you can create and save your setups in seconds with multis, and recall them at any time with the touch of your finger. With SampleTank, you're in complete control. And while you can use the onboard touchscreen keyboard and drum pads to play your sounds, the real fun starts when you explore IK's world of external input options. Keyboard player? 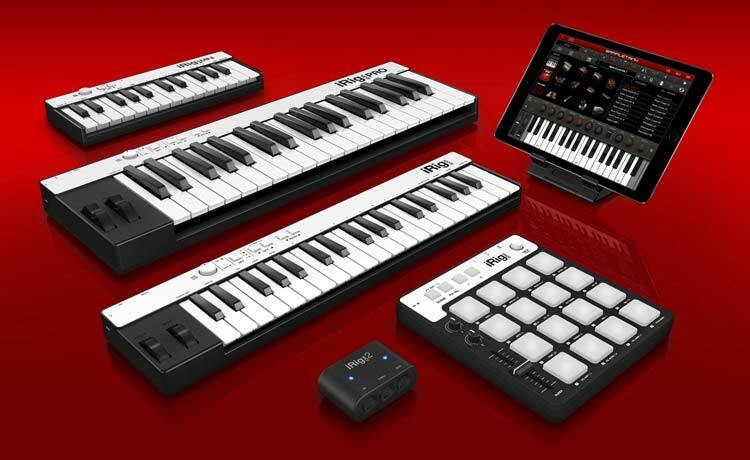 Try SampleTank with an iRig Keys or iRig Keys Pro, compact, portable 3-octave keyboards that you can use while on the go. Want versatility? Use an iRig Pro, iRig Pro Duo or iRig MIDI 2 interface to connect any MIDI-compatible keyboard or external controller. Want to get creative? Plug in iRig Pads, and you'll be able to take advantage of its 16 pads and fully customizable knobs, buttons and sliders to turn SampleTank into a beatmaker’s dream rig. 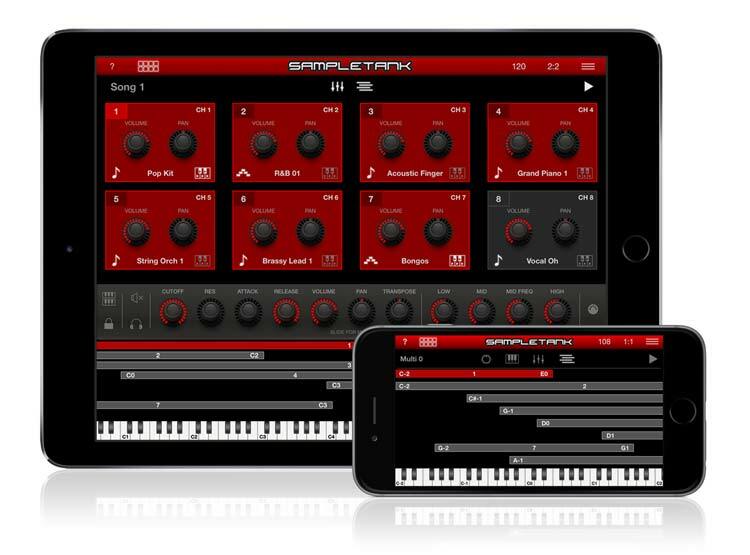 SampleTank is also compatible with Inter-App Audio and Audiobus (a third-party app that requires separate purchase) in iOS 8 and above. That means you can send its output through other audio apps — like AmpliTube, GarageBand and many others — to be filtered, recorded, looped and more. The ability to share audio between apps opens up the potential for incredibly creative possibilities. SampleTank also supports background audio, which means it can play in the background when other audio apps are playing in the foreground. This allows for even more layering opportunities and the potential for extremely unique audio combinations. Download SampleTank today to experience what its world of sounds inspires in you.